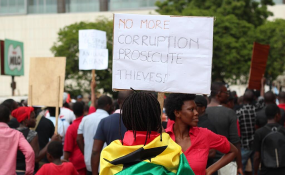 Ghanaians protest against corruption (file photo). The Public Procurement Authority (PPA), the public sector procurement regulatory agency, has introduced an electronic platform called Electronic Government Procurement (EGP) in collaboration with the World Bank to eliminate fraud in procurement and ensure transparency in public procurements in the country. The decision by the PPA to introduce the electronic platform facilitated by European Dynamics, a Greek international information technology company, stems from the recent fraudulent acts that have been associated with public procurements in the country. The system will strengthen the tender processes in the procurement sector of the economy to save revenue for the state. According to the PPA, the advent of the electronic system will ensure suppliers are verified electronically, thereby eliminating the personal contact with procurement officers. Speaking at the launch of the platform in Accra, Mr Agyeinim-Boateng Adjei, the Chief Executive Officer (CEO) of PPA, said the process for the introduction of the system begun in 2011 under the auspices of the Ministry of Communications with PriceWaterhouse Coopers as the consultants for the projects. He claimed that the system will offer availability of information on all public procurements and increase competition among business people in the country. He maintained that EGP has the capacity to strengthen procurement and increase supplier's compliance with the procurement policies of the country. According to him, the new system offers less fraudulent practices, meaning the procurement processes can no longer be manipulated until the deadline for the processing has duly elapsed. He said the system will reduce the collusion between suppliers and the procurement officers which often leads to corruption and inflation of procurement prices in the economy. He minces no words to say that PPA earlier took upon itself to investigate the perceptions of corruption in the procurement sector and it was realized that the process of setting up tender committees for the procurement processes was fraught with corruption, hence the need for the new system. He said, with the new system, suppliers will have to register on the EGP platform and their tax compliance electronically verified by the system as the EGP was linked to the Ghana Revenue Authority (GRA) platform. He said evaluation, verification and quotations of the procurement process will be done electronically thereby eliminating human contacts in the procurement of goods and services for the government. A representative of Vice President Dr Mahamadu Bawumia and a member of the Technical Committee of the EGP project, Dr Gideon Bauko, in an interview, said the Vice President's office took keen interest in the project to be able to track all procurements centrally. He said the system will further reduce the cost of doing business with all government institutions because it takes quite a long time doing business with the government agencies. Mr Nelson Osae, the Project Coordinator, said the project aims at improving service provision in the country. He said the system will offer transparency and efficiency as well as value for money in public procurement sector of the economy. He added that the project will be replicated in the Ghana Immigration Service, Judicial Service and Parliament to improve upon transparency in all government agencies. Copyright © 2017 Business Day Ghana. All rights reserved. Distributed by AllAfrica Global Media (allAfrica.com). To contact the copyright holder directly for corrections — or for permission to republish or make other authorized use of this material, click here.